Members are invited to bring an unlimited number of guests each season to join them for a dining experience at the DYC, while enjoying one of the best views of the Marblehead Harbor. The kitchen and dining room have experienced a number of improvements over the last few years and the DYC is now ready to resume its position as the most sought after casual dining experience in Marblehead. The restaurant focuses on serving simple but well-prepared dishes using fine quality, fresh ingredients and served in a relaxed and casual setting. You'll find seasonal salads, burgers and sandwiches as well as a selection of fish, meat and pasta dishes on the menu. A number of vegetarian options are available and other dietary needs can be catered for on request. Enjoy a cocktail, glass of wine or craft beer in our fully licensed bar. The bar has a lively, friendly and relaxed atmosphere and the full restaurant menu is served. 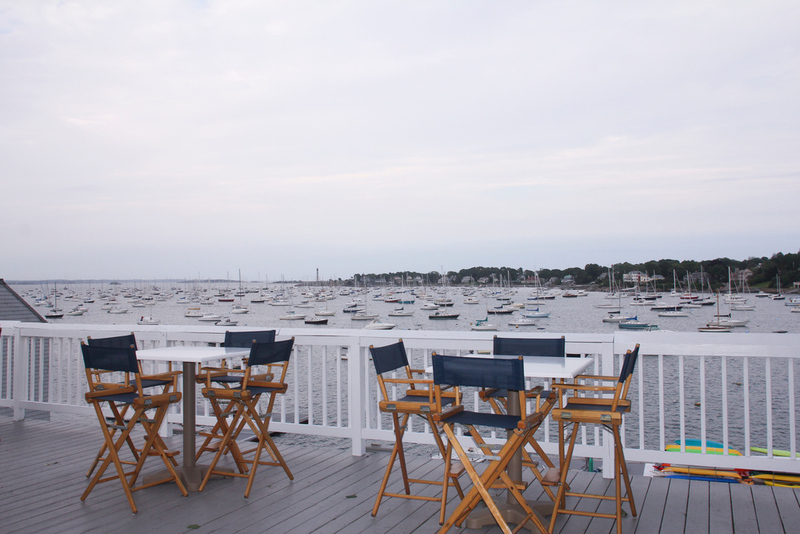 The upper deck is open for guests to enjoy their drinks with an amazing and uninterrupted view across the harbor. Watch the boats come and go, and soak up the summer sunshine. We can't think of a single better place to be after a long work-day (or a day sailing up the coast and enjoying some hidden coves with the kids). To better serve our membership, we are enforcing the regulation which states that all members must provide their member ID card when using the dining and bar facilities. No dining or bar tabs will be opened for guests until the member hosting them is present and able to provide their membership number. Members must also provide a member ID number when calling for reservations. Please note that dining reservations can only be made by phone. We will no longer accept reservation requests by voicemail or by email. Please call the club between the hours of 12:00Pm and 9:00pm. Further, please note that reserved tables will be held for a maximum of 15 minutes and then released unless the dining room is notified in advance.